A dusty old brass gramophone stood in the corner of the square, sparsely furnished room. The only other piece of furniture was a long wooden divan seat that doubled for sitting and sleeping. Black and white photos of Ali’s grandfather wearing military uniform hung on the patchy wall with a colourful metallic Happy Birthday banner draped over them and the black modern flat screen digital TV. There were odd plug sockets in the peeling plaster at different heights with black cables hanging from the TV, the extra long cable looped around a nail before it joined a multi-socket adapter. A calendar hung next to the TV. Nothing was horizontal or considered. Doors opened on three sides of the cool white room. One into another room, one into a corridor to the kitchen and the other out into the yard where direct sunlight bleached out most of what could be seen, solarising any visibility. Nothing was moving outside. The dogs were all asleep. The only movement was Surekha walking barefoot back and forth to the kitchen, her ruby and pink chiffon silk sari inflating with air as she walked, its gold edge describing the air currents as she moved like rose petals floating on the water in the lake. Her hennaed feet were dirty from the dust and the noise of the chain round her bony ankle was just audible over her footsteps that shhhushed along the freshly swept floor and the stiff sari skirt fabric that pulled against her legs. Ali wound the small handle on the side of the wooden box, the polished wood was fine in his chubby fingers. Then he picked up the strangely hinged muscular metal arm of the gramophone player. It turned about ninety degrees from fitting neatly in the corner of the box to its position on the dusty vinyl that had a pristine picture of His Masters Voice. The engraved Edison sound waves crackled and jumped a bit at first then as the label spun fast enough not to see without moving your head round at the same time, the music came out of the scalloped yellow brass trumpet. Surekha placed a breakfast tray of tea and cauliflower curry on the divan. ‘Do you want some lunch today?’ she asked. The linear velocity of the old turntable continued as the disc finished and the needle slid back out of control across the black 78. ‘I have to check my Facebook page. Is this my breakfast?’ asked Ali sitting his well upholstered brown body on the divan like a silk cushion in a palace. ‘Yes.’ His Bollywood teeth smiled between his dark moustache and small beard. The yellow and green auto rickshaw was decorated with painted bright emerald and sapphire peacock feathers. Peafowl are traditionally protectors, the national bird of India and killers of snakes, a thousand eyes watching the traffic as it slithered through the streets of Delhi like a cobra. The trucks seemed to sit in the outside lane, hogging it like a stubborn elephant, oblivious to other traffic that had to undertake them. 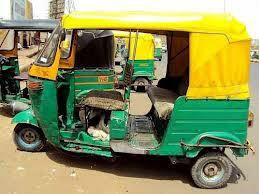 Ali’s auto rickshaw drove in and out of the other cars ‘beep beeping’ and weaving a multicoloured pattern durry. ‘Dudududududududud’ went the engine continuously shaking and juddering the seats and mirrors. This was his road map of life. A tree of life durry rug took two months and was big enough for two people to sit on, his daily durry took one day and was big enough for all of Delhi. Ali reached one of his favourite waiting places and took some tea chatting to the other drivers. Soon he had his first fare, a tourist who wanted to go to a guesthouse. They argued over the price until they agreed. The second fare was an Indian family wanting to go to the train station. The third was a couple who wanted to go to the romance gardens. He was having a good morning. Ali caught sight of a police motorcycle in one of his mirrors as it juddered and vibrated with the engine. Better put my blue uniform shirt on he thought as it was a reason to stop him and check if he was using his meter. He pulled over next to an ATM. The guard was waiting outside on a chair as the customers appreciated the cool air conditioning inside. One of the customers a tallish fair haired man in his early twenties wearing aviator sunglasses, a white shirt and grey shorts came out looking slightly lost. He looked like the typical backpacker a bit vague and on the verge of self discovery and the probability of him having tried cannabis looked about 75%. He waved at Ali. Ali started the auto rickshaw and pulled out into the traffic looking for gaps and beeping at everyone else. ‘Where are you from?’ asked Ali. ‘London, England,’ replied his passenger whose name was Gordon. ‘What ?’ shouted the passenger. ‘OH! I have to get to Jaipur airport. The stupid ATM says it takes twenty four hours to register my card number before it will dispense any money and it’s Sunday the banks are shut so I can’t buy any more rupees. ‘ He was frustrated by his failure to get to his money and blaming the machine and talking about it helped. ‘Have you just arrived in India?’ asked Ali. The guy folded out his money and counted thirty rupees. ‘No.’ He paused,’ Yes. No. I don’t know,’ replied the man who went inside the shop. Ali could see him inside waving his arms one minute and putting his head in his hands the next. He was panicking slightly. After about fifteen minutes of listening to a stream of ‘aacha aacha’- OK from the travel agent he came out again. And went back to Ali’s auto rickshaw laughing slightly maniacally, slightly amused by his useless progress and situation. ‘You can’t afford it because you have no money – the ATM needs twenty four hours to register your card!’ said Ali laughing. ‘The only way I could pay you was if you flew to Udaipur with me and came to the wedding then I could pay you tomorrow. Then you could fly back to Jaipur and drive back here,’ he paused again. The guy made a phone call finding it difficult to hear in the noisy traffic. Then he came back to Ali. Ali suddenly realised this man was now serious. Another fifteen minutes passed and he came out again this time smiling. Ali drove back to his house earlier than usual and pulled into the yard where Surekha’s saris hung out on the line large squares of red and yellow against the golden wall, the tiny mirrors embroidered on them reflecting blinding rays from the sun. The noise of the engine woke up the dogs that jumped up and ran around not knowing where to go. Ali asked the man to wait. ‘You stupid mongoose. Why do you want to trust this snake? What happens if you can’t get back from Udaipur?’ said Surekha. ‘Peacocks should stay under the trees not try and fly over them.’ She was still grumpy. ‘Yes you will you’re jealous. You have a beautiful peahen crown on your head. He is paying me nine thousand rupees. That’s what I make in a week. I will bring you back a present. Wait I’ll get you a flower.’ He put a smart shirt on and got a small bag, then asked Gordon to come in and meet his wife. ‘Better get some water, he will need water,’ she called after him. There was still a haze over the tree tops on the outskirts of the city where the elevated road was at the same level. Rubbish and plastic littered some of the branches. ‘Would you like the air conditioning on?’ Ali asked as they got underway. A large truck ahead of them put on its airbrakes and several different horns ‘beep beeped’ in unison. People were walking along the roadside to school or work passed the piles of yesterday’s burning litter. Two men walked one with his arm around the other affectionately. Somebody riding a bicycle had to swerve to miss a dead cow behind the concrete blocks and sections of unbuilt reservation that had long metal pins sticking out. The buildings behind had scaffolding made from tree trunks, tall branchless poles supporting the many floors waiting for walls and windows. Small boys played cricket in the gardens that hadn’t been made yet where a big digger sat abandoned. Everything looked like it was waiting to be finished. ‘Dududududududud.’ Ali climbed through the gears then pulled into a petrol station near the polo club and racecourse. ‘We won’t get far without petrol. Do you need any water?’ asked Ali. They had been travelling about twenty minutes. It seemed like a long journey ahead. Longer than the train journeys that were the same length. Gordon worked out they would be half way there by 1pm and tried to look at the scenery with equal interest but the wheat fields started to all look the same and the overloaded trucks of cattle feed and local jeeps full of passengers who hung off the back repeated themselves. I’m in India he kept reminding himself. He inhaled and smelt India and the sun on his face and dry humidity that made his body tired. The main roads smelt different to the smells of garlic, tobacco, roses, tea and melon that scented the bazaars. Soon they were driving again. He read the hoardings for businesses and advertisements with Bollywood stars wearing sunglasses for a while then shut his eyes. When he opened them he noticed a fly was caught inside the windscreen. It crawled across the glass manufacturer’s logo. He read the tempered safety glass information and serial number. I would never normally pay so much interest to something so mundane, he thought as he watched the fly interested in the sweet coconut water that had been spilt by someone yesterday when a passenger had lost his footing. He spent what felt like another half an hour doing a post mortem of the interior of the auto rickshaw. The egg yolk yellow paintwork of the front windscreen and door frame pillar was marked and chipped with black finger prints and smudges from sun baked food or oil picked up probably at a petrol station. Above the windscreen was an anonymous painting of a pretty girl and some official writing in Indian, possibly a registration notification. The auto rickshaw in front needed a new stud fastening to hold its flapping canopy down and protective cages covered the indicators and the wing mirrors stuck out on long metal arms unlike the short ones on modern cars that spring back into position if they are hit . The mirrors were badly in need of a clean from their daily coating of dust and pollution. Gordon stopped his reportive distraction and checked his watch. ‘How long have you been married?’ Gordon asked Ali. As he said this they were overtaken by a car with Rajasthani music playing. Gordon’s eyes followed the telegraph wires for a while then they lowered to look at the flat countryside. The silhouetted cables made endless waves. Beneath them he saw some small children, babies, three years maybe collecting plastic to sell for recycling and he wished they were chasing the small squirrels and lizards instead. ‘How do you get an elephant in the fridge?’ asked Ali. ‘I don’t know, how do you get an elephant in the fridge?’ replied Gordon. ‘How do you get a giraffe in the fridge?’ asked Ali. ‘Open the door, put the giraffe in the fridge then close the door?’ answered Gordon with a question. ‘No. Open the door, take elephant out first then put giraffe in and close the door,’ he laughed to himself finding it hilarious. Ali pointed out a fort on a hill in the distance. Gordon counted down the minutes to the half way mark. Then suggested they stop for some tea and food. Ali pulled into the next village and parked his auto rickshaw near the chai stands. At last the ‘dududududududud’ stopped. Gordon reached behind him to get his sports bag from the back shelf and pulled himself out using the silver frame. Sitting in the confined space his legs had become stiff and they gradually eased as he walked. There were mango and guava trees by the roadside. A few small children came over to see who had arrived. They found a small restaurant and Gordon had a sagwala curry and saffron butter lassi. The delicate golden saffron strands bled colour into the thick curd as he swirled his straw. They spent about half an hour having lunch and a comfort break. Gordon looked at himself in a broken mirror in the bathroom of the restaurant. A piece was missing from one corner. He had to move his head to one side to see properly. His long fringe was matted and scruffy from the heat, humidity, wind and dust. He checked the time on his watch. It would be about 8 am in the UK he thought , then he emailed his brother in Udaipur to say that he was on his way. Gordon went back outside to rejoin Ali. At first he couldn’t remember where they had parked the auto rickshaw. He looked around and went up to several parked nearby but none of the yellow and green bodies had the bright peacocks feather’s eyes. It wasn’t there. He waited about two minutes wandering if his driver had gone to get petrol and then started to feel sick. It suddenly occurred to him that maybe Ali had gone. But why would he go, he had no reason and still had to be paid. He looked around scratching his head. Then he heard a ‘beep beep’ and the auto rickshaw appeared. ‘I thought you’d gone. Where were you?’ asked Gordon. ‘ It was 1800 rupees you meant wasn’t it? 9000 there and 9000 back!’ exclaimed Ali looking serious. He had Gordon miles from anywhere totally in his control and he knew he could call the shots. ‘What!’ Gordon didn’t know what to say. He was in shock. Suddenly this man had turned really bad on him and he realised he had possibly exposed himself slightly too much as a vulnerable tourist. ‘Only kidding!! Come on don’t waste time to get in. We have a plane to catch!’ said Ali. Gordon was still in shock. The second half of the journey was the same nonstop ‘dudududud’ juddering and blurred vision. Gordon counted down the hours . They were over the hill now and he started to feel more relieved. Three to go, two to go. One hour had never felt so long and so short. Eventually they reached the airport by 5.45pm. Ali parked the auto rickshaw somewhere safe for the night and they checked in. With little luggage to scan it was very quick. The airport was fairly empty and there were plenty of seats in the cool interior. Both Gordon and Ali sat quietly for several minutes. The ‘beep beep beeping’ had stopped and the full throttle engine had stopped. Gordon was watching a fattish man of about fifty five sitting on the floor meditating. He was wearing a grey suit with a white shirt and grey hat over his white hair, his Gladstone bag was next to him on a seat. ‘How are you at flying? Are you OK on planes?’ asked Gordon. They were both dazed from the journey and welcomed the tea and juice and sweet snack that was served on the plane. Up into the clouds and back down seemed very quick. The trees, lakes, houses and roads suddenly returned to their normal size as the wheels skidded slightly on the runway. Ali braced himself as the powerful brakes were put on and the wing flaps went up. Then it was back out into the hot air. Once they had cleared customs they left the terminal and were greeted by a row of taxis holding handwritten white paper signs with names. ‘Pleased to meet you,’ said Craig. ‘Yes, he’s a good all rounder,’ agreed Gordon. Craig paid him the money. Ali retired earlier than the others and left them to catch up as the wedding was the day after tomorrow. ‘April is good luck for weddings in India,’ he said as he left them to get on the plane back to Jaipur in the morning. He was back in the traffic again weaving and beeping for another seven hours. When he got home he wound up the gramophone and listened to the crackling notes on the vinyl. Surekha was sitting on the floor preparing some food, peeling onions and separating beans in a pot. ‘When I am driving I know what is ahead. I can see all the traffic but I have to use my mirrors to see what is coming up behind me. I could not drive without my mirrors because my neck would ache. This stupid man was going forwards in a backwards way. He had his money behind him and no information and he had to wait twenty four hours for his British money card to register in this country, he couldn’t see where he was going, there were too many things obscuring his path and his inner vision. He had no mirrors to see but I could see his funny face in mine. All he could see was his own face too probably. Now all I want to see is the reflection of the palace in the lake.’ He laid back and listened to the birds singing and smelt the garlic and masala cooking slowly on the stove. really enjoyed it. It conjured up lots of images and very vividly too. I liked the comparison to mirrors and view of life at the end.